Microsoft says 3200 Android users report malware horror stories | Android Blast! Microsoft made an offer to Android users who were victims of malware. If they shared their horror stories with Microsoft, they could be eligible for a free Windows Phone. Microsoft would offer the free phone to the Android users with the best stories. 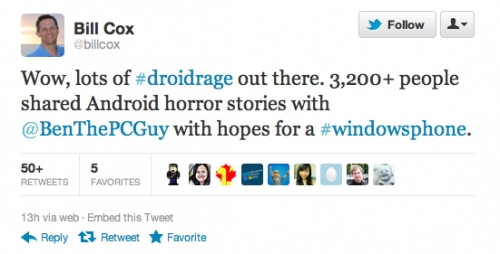 Today, Microsoft�s senior Director of Windows Phone communications, Bill Cox, tweeted that over 3,200 Android users shared their stories with Microsoft. There is no way to verify that all 3200 actually had malware, as they could have just been going for the free Windows Phone. However, Microsoft is certainly going to tout the number as they make the case that Windows Phone is safer than Android.